Transform your retail store into a hub of high-stakes cyberstruggles and connect with your community’s most enthusiastic Android: Netrunner players! 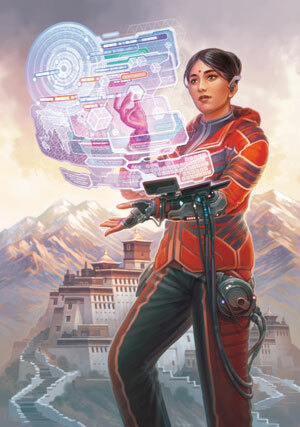 As the popular Android: Netrunner LCG® continues to follow the heated election debates of the Android setting’s Indian Union, all the major players are getting in on the action. Now you, too, can get a piece of that action with the Spring 2016 Android: Netrunner Tournament Kit. With its high-quality acrylic tokens, alternate art cards, and a promotional poster inspired by the Mumbad Cycle, Spring 2016 Android: Netrunner Tournament Kits are designed to help you host a compelling tournament or other event. What Will I Find in a Spring 2016 Tournament Kit? 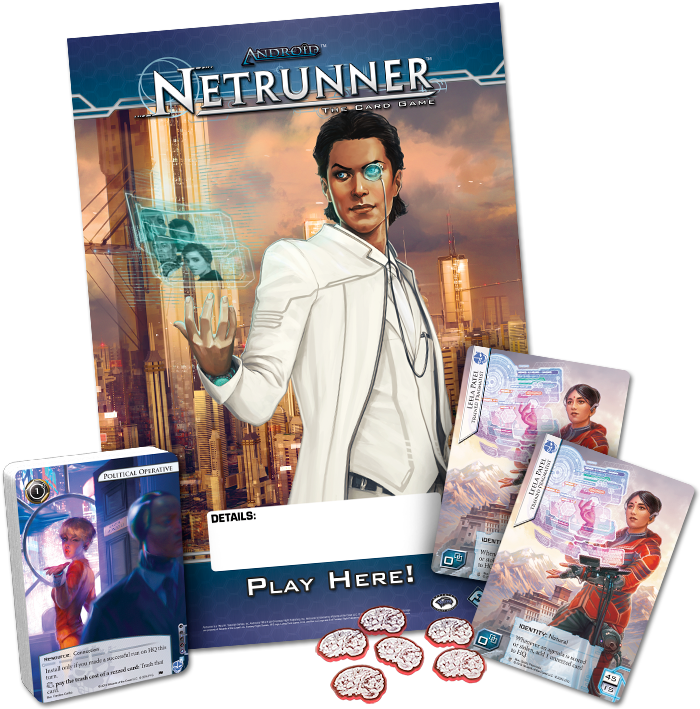 Android: Netrunner challenges players to navigate a constantly shifting virtual landscape, and a Spring 2016 Android: Netrunner Tournament Kit comes with prizes and materials intended to keep your players’ tournament experiences fresh and exciting. One set of acrylic brain damage tokens. Runners always assume a measure of risk, and if they’re ever going to get their brains fried, they’ll at least be able to do it in style! Two copies of an alternate art Leela Patel identity card. Since her introduction to the game, Leela Patel has rapidly become a fan-favorite identity due to her ability to “bounce” cards to HQ from play. Seventeen copies of the alternate art card, Political Operative, one of the newer cards from the game’s Mumbad Cycle. A promotional poster depicting the Criminal Runner and Mumbad information broker, Nero Severn. One informational pamphlet on running an Android: Netrunner tournament or league. Our Spring 2016 Android: Netrunner Tournament Kits are designed to support in-store Android: Netrunner events run between April and July in a variety of ways. We recommend using a kit’s contents at a tournament, a demo day, or a casual game night. However you use a kit, you will find guidance within its informational pamphlet, which offers tips and ideas about how to run a great event. Don’t miss out on your chance to make your store a central server for the growing Android: Netrunner community. Order your 2016 Spring Android: Netrunner Tournament Kits today! If your store is in the U.S., you can place your order now through your distributor or your sales rep. If you are an international retailer, you should contact your distributor. Based on the classic card game designed by Richard Garfield, Android: Netrunner The Card Game is a game for two players set in the dystopian future of Android. It pits monolothic megacorps against subversive netrunners in a high-stakes struggle for the control of valuable data.